While looking through the database “African American Newspapers” for references to music, I came across a letter regarding a recent concert by the Hutchinson Family Singers for Henry Clay that included music thought to be abolitionist in nature.1 Published on in New York on March 22, 1848, this letter, from “L.P.” is addressed to Frederick Douglass, politely suggesting an alternate account of a performance Clay that Douglass had criticized. The Hutcherson Family Singers. 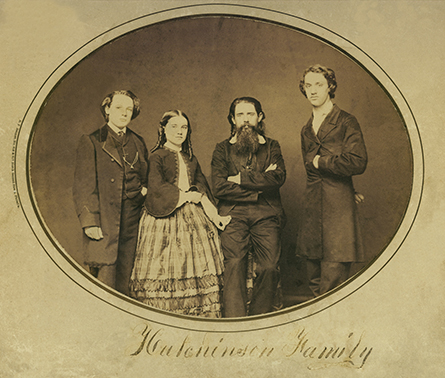 From left John, Abby, Judson and Asa Hutchinson c. 1846. According to L.P., the Hutchinsons sang rousing abolitionist music, some of which had been added to in order to be more abolitionist. Douglass’s complaint was that the traditionally abolitionist Hutchinsons2 had gone over to the other side, singing in honor of Henry Clay, an American legislator who owned slaves but supported gradual emancipation.3 L.P., however, wished that “would to God that the Hutchinson Family might sing before every slaveholder in the land; the effect would be to greatly hasten on the ‘good time coming,’ when every slave should be emancipated, and mankind should love each other.” While the controversy of this performance is fascinating, diving into the songs mentioned in the article as abolitionist songs unearths an interesting contrast between these “abolition” songs and contemporaneous slave songs that yearned for freedom. 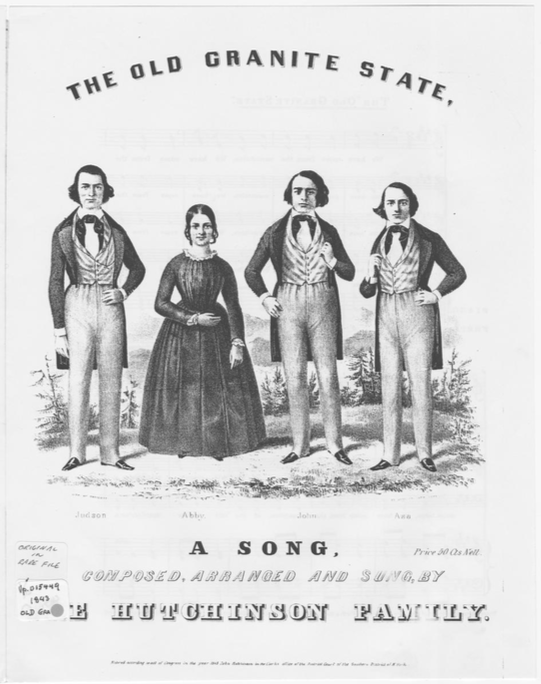 Sheet music for “The Old Granite State” from 1843. Verses about abolitionism and temperance were later added. And we cannot be enslaved. From the Old Granite State. It is quite evident from these verses that the Hutchinson’s demonstration of abolitionism was tightly tied to their New England pride. For example, this song that the article’s author claims could persuade slaveholders to support emancipation is named “The Old Granite State,” a nickname for New Hampshire. The Hutchinsons’ and L.P.’s understanding of emancipation and the need for freedom as expressed through song appear to be quite different that of the slaves themselves. Instead, many slave songs dealt with themes of Christianity, and the need to hold onto God’s love in order to get to a better place, spiritually and physically. Songs like “Go in the Wilderness” were rooted in the reality of slavery, and the need to escape through faith, hope and perseverance. Singing was a way of survival.7 The Hutchinsons, however, chose to use music to express their belief in abolition and temperance through the lense of their New Hampshire pride. 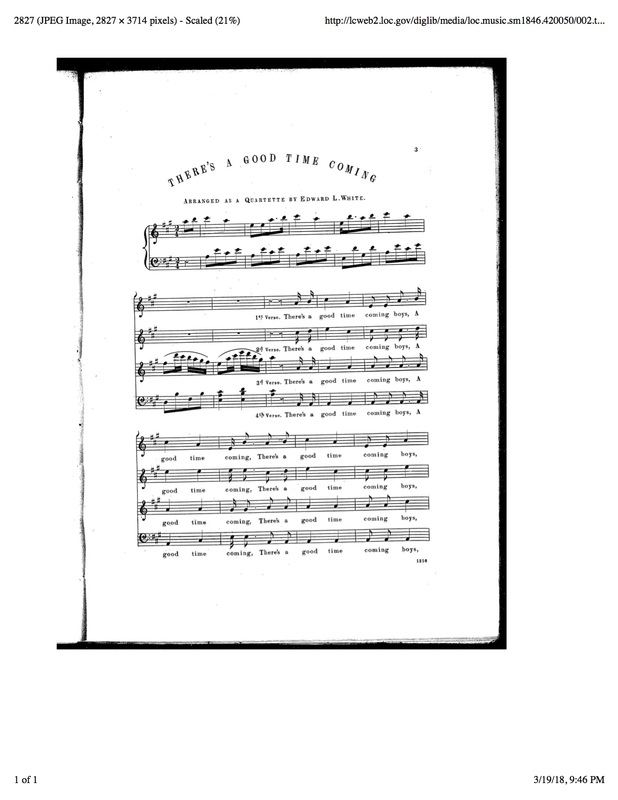 While there is no reason that the Hutchinson’s song for emancipation and slave songs should be exactly the same, it is important to note the different tones that each take, as it is reminiscent of parallel differences between African Americans and white northerners about the importance of freedom and equality in comparison to other social issues. Perhaps, then, Douglass was right to chide the Hutchinson’s for their mild claim to abolitionism. Could a family of white New Englanders be adequate ambassadors for abolition to Henry Clay? Or perhaps there was something truly special about the way the Hutchinson Family Singers performed on that night, as the author of the article claimed. 1 L.P. “The Hutchinsons.” The North Star (Rochester, New York). March 22, 1848. America’s Historical Newspapers. Accessed March 19, 2018. 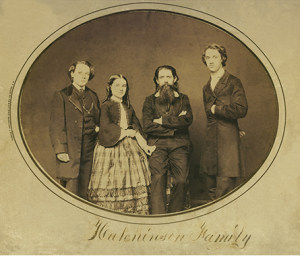 2 “Hutchinson Family.” In The Harvard Biographical Dictionary of Music, edited by Don Michael Randel. Harvard University Press, 2003. https://ezproxy.stolaf.edu/login?url=https://search.credoreference.com/content/entry/harvbiodictmusic/hutchinson_family/0?institutionId=4959. 3 Gigliotti-Gordon, Kate. “Clay, Henry.” In Encyclopedia of African American History, 1619–1895: From the Colonial Period to the Age of Frederick Douglass. : Oxford University Press, 2006. http://www.oxfordreference.com/view/10.1093/acref/9780195167771.001.0001/acref-9780195167771-e-0122. 4 Hutchinson, Edward L White, and Charles Mackay. There’s a Good Time Coming, Ballad . Oliver Ditson, Boston, monographic, 1846. Notated Music. Retrieved from the Library of Congress, Accessed March 19, 2018. https://www.loc.gov/item/sm1846.420050/. 5 Saletan, Tony and Irene Kassoy. “The Old Granite State” Folk-Legacy Records, Inc. 2006. Post to YouTube Oct. 11, 2014. Accessed March 19, 2018. https://www.youtube.com/watch?v=IZgl6kzlztU. 6 Hutchinson Family. “The Old Granite State” The Mudcat Café. Accessed March 19, 2018. https://mudcat.org/@displaysong.cfm?SongID=6775. 7 Southern, Eileen. The Music of Black Americans. New York: W.W. Norton & Company, Inc., 1971. Pg. 106. 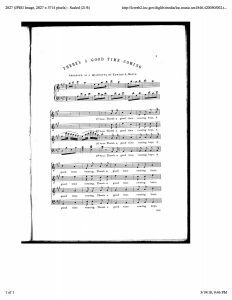 This entry was posted in Lily Tupper and tagged Abolitionist Music, Hutchinson Family Singers by Lily Tupper. Bookmark the permalink.